The Infant of Prague Statue with Dress by Religious Art features a real fabric dress. 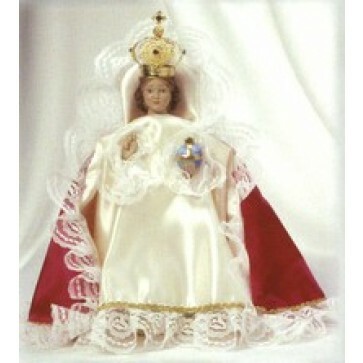 The Infant of Prague design originated in a monastery in Bohemia and was originally designed as wedding gift. The statue was smuggled out of the country after a period of unrest and was later found broken. Once repaired, miracles began happening that were attributed to the statue. The beautiful replica Infant of Prague Statue is designed from the original piece of the same name, but features a colorful satin dress and removable crown.